Leading Manufacturer of 3.5mm cortex screw, 3.5mm cancellous screw, 3.5mm malleolar screw and dhs screw with compression from Delhi. We are offering in 3.5mm cancellous screw good international quality.It is available in both steel and titanium. 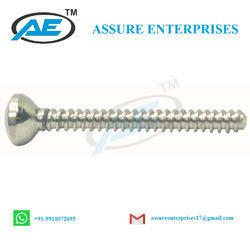 Assure Enterprises offering 3.5mmMallelar Screw in SS or Titanium to our clients. We are offering DHS Screw With Compression to our clients.